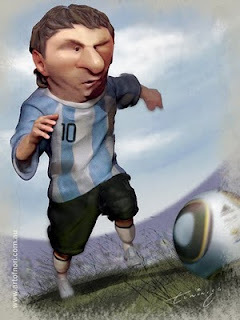 Well here he is, little Messi sculpt, plonked into an illustration. What a great tool Zbrush is for illustration work. Not to mention having a model there to pose for something else. In the end though it's about the same effort into a painting as much as it is in a sculpt? Pros and cons to everything as they say. Hoho, fantastic man! This image is perfect! You're a great artist in 3D too... I'm your fan! Interesting combination with the zbrush model and illustration. I can see you doing some pretty sweet stuff with this. Looking good Nori. Nice work! cool! i love it! gotta learn 3D some day too! I loved the background...Congratulations !!! thanks for your comments much appreciated! Nice work Nori - certainly got to do this stuff one day downloaded ZBrush ( and MudBox) .... don't think my life's long enough to get my head around them !! really love this nori. great work buddy. what a super star as well. Hahaha! - this is ace. Love the camera angle! the the proportions and style. Great work!